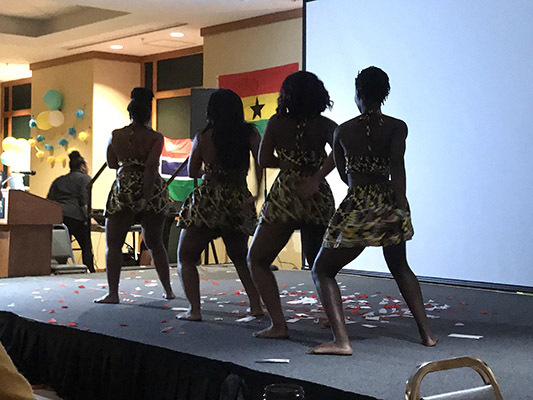 On Thursday Nov. 16, Africa’s Legacy held their eighth annual dinner, a night of fun, food, and performances. 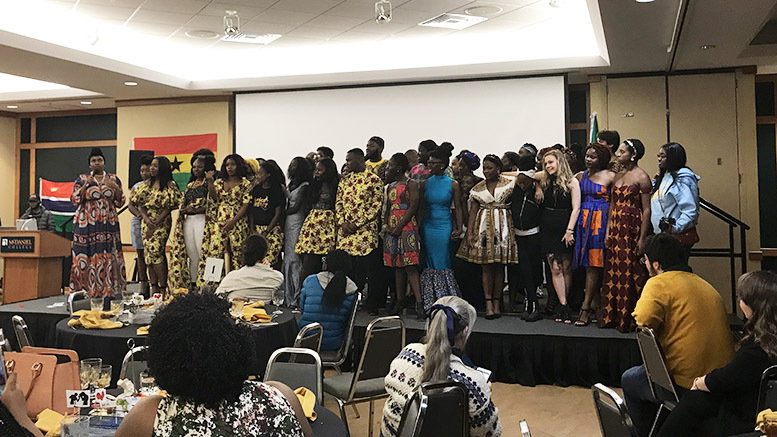 There was an enthusiastic energy to the room the entire night, with the members of Africa’s Legacy celebrating their cultures and educating those in attendance. This year the dinner was entitled “Clash of the African Regions,” and it was a fight of champions between three of the regions of Africa: East, South, and West Africa. A skit at the beginning introduced the regions and the battle between them, and dinner-goers were told that at the end of the night it would be up to them—they would vote and choose which region of Africa had performed the best. The dinner also tied in a donation event—Africa’s Legacy is working with a student, Manaal Moussa, who is collecting toiletries for women in Togo. Music was played as members of Africa’s Legacy went around the room collecting money for the cause. Each of the regions were introduced—East, South, and then West—and each region put on performances. Each of the performances were a combination of traditional dance, modern dance, informative facts about the region, and more. The East began with a skit with three football players, portraying the three regions, and the East was described as small, but mighty. Their section went on to give facts about the East, such as having the largest lake and the largest mountain—Lake Victoria and Mount Kilimanjaro. The South opened by entering with drum beats and filing onto the stage. Their performances included two dances and a spoken word piece in which student Allysa Mpofu talked about leaders of the South including Nelson Mandela, Desmond Tutu, and Sir Seretse Khama. Additionally, the audience learned that there are twelve official languages in South Africa, and that it is the Land of Diamonds. The West put on a skit taking place in a village. Dancers performed both modern and traditional dances for the king of the village. Throughout the West’s performances, they had informational segments where they asked “did you know?’ and included information about the West and Africa in general. It was then time for the final decision. Attendees of the dinner voted on which region was the best, and after drum rolls the third, second and first place winners were announced—with the South coming in first. All of those in the South regions came up on stage to celebrate, and the Legacy dance team came up to perform. The Legacy dance team performed twice during the night, before and after the introduction to and performances by each of the African regions. They were bookends to the performance, bringing Africa’s Legacy and the African regions together. After the dance team, each member of Africa’s Legacy came up onstage for the fashion show segment, portraying different African clothing and styles. Every member got to have a small moment where they showcased their clothing. The event concluded with closing remarks from one of the Africa’s Legacy advisors, Ambi Shannon. She praised Africa’s Legacy on their dedication. She detailed the efforts of the members of Legacy and repeatedly asked the audience to say the word “initiative” in response, emphasizing how much initiative and drive that Africa’s Legacy has and how they will continue to excel because of those qualities. 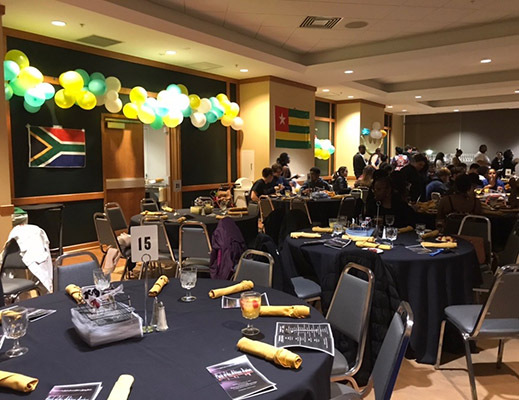 Africa’s Legacy meets in Hill Hall 017 on Thursdays at 9 p.m. Their next big event is United, which will take place the Friday before Spring Fling.